Road to Building a Tiny House! Over the past couple months I’ve been feeling like it’s really time for me to move out. But… there’s several reasons that’s not gonna happen quite yet :T. Mostly I don’t get paid enough wages to make it living on my own yet. And I probably won’t have enough saved up for a year or two. This is really disappointing. And then I suddenly remembered Tiny Houses! A few years ago or so I’d read about the Tiny House movement, found a layout I fell in love with and so on. Then as time went on I promptly forgot all about it, it wasn’t practical for me anymore as I had other plans! Well, time kept on keepin’ on and those plans fell through. And eventually I found myself sitting here in my small room, wishing I could afford my own place. And a new plan was hatched! If I save my pennies through the winter, I might just have enough to get a properly-sized trailer and some lumber to start with, and i could very well build my own tiny trailer house throughout the summer! I left a space for the door, dotted lines are windows, dashes are counters/desk space. 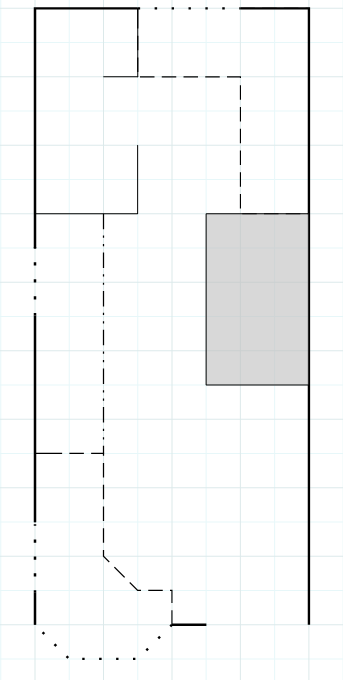 the dotted dash is a storage chest/couch situation and the grey’d area is where the woodburning stove would go(The stove is 1’x2′ (with “accessories” that make it more 3’x2′) but the grey would be the heat-proof’d areas) The small room in the upper left is the bathroom/shower, and that little corner hall would have the kitchen sink and counterspace and storage and so on. The scale here is that one square is 1’sq so the trailer would be 18ft long and 8ft wide! So far so good yeah? I haven’t quite gotten everything figured out yet, and if necessary I can expand it to 20′ for extra utilities space. In the next few weeks I plan to mock it out full size in the backyard in the snow (nobody’s been back there yet =u=) and kind of go through and make sure there’s enough room. I made this purely on assumptions so it’s very possible I’m completely wrong haha. I have low experience in building things but I have my older brother who knows a LOT and if he had the funds could probably build it in a summer haha. But he’s far away so it’s up to me! I assisted in leveling my sister’s cabinets, rewiring her kitchen, demo-ing her bathroom, re-drywalling her bathroom, finishing bro’s gf’s room (molding and spackle) and things like that. I’ve measured and cut lumber, spraypainted various items, and so on. Pops has the tools, and probably some skills as well. And Bro’s got the skills I don’t so I’m sure he can give me some guidance! Although if any of y’all have any relevant experiences or resources to share I would love to hear what you’ve got to say!